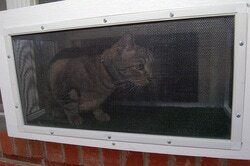 Cat Window Patios from CWAA Crafts! 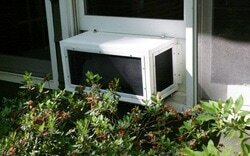 - Cat Window Boxes and Patios that fit into the window like an air conditioner! 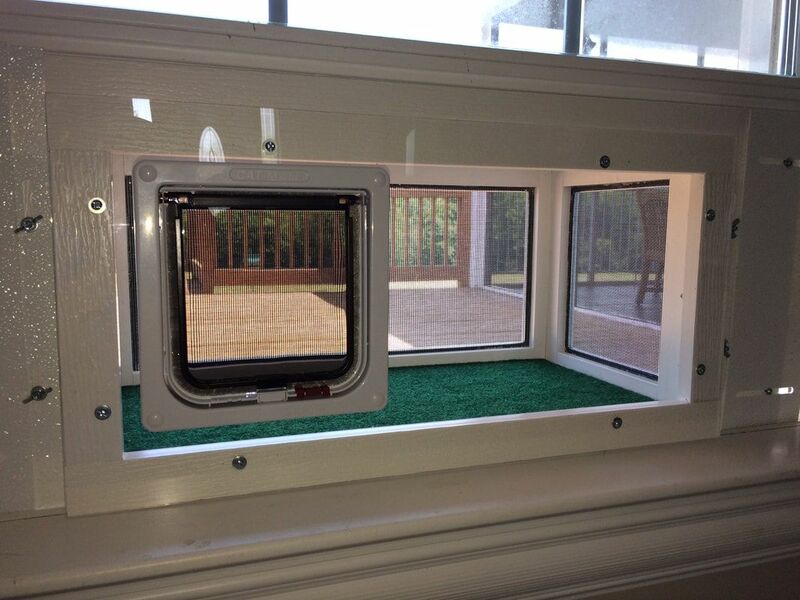 Our cat window patios give your indoor cat an outdoor experience! 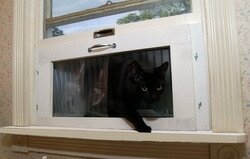 Hand-Crafted Window Patio Enclosures For Cats! 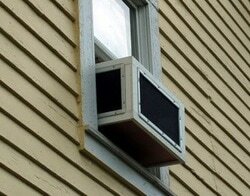 Fits in the window like an air conditioner! 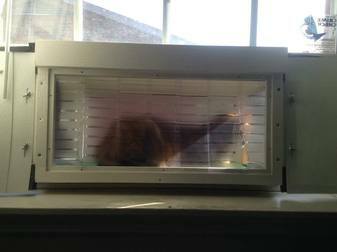 Now offering models for Up/down and Sliding Windows! DO YOU HAVE AN INDOOR CAT? 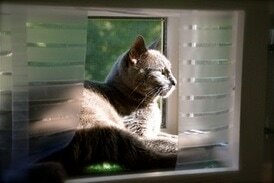 Does your cat spend hours peering out its favorite window? Does it yearn for the sights, sounds, and smells of the outdoors? Is your pet a house cat with an "outdoor adventurer" personality? Why not give your INDOOR cat an OUTDOOR experience? 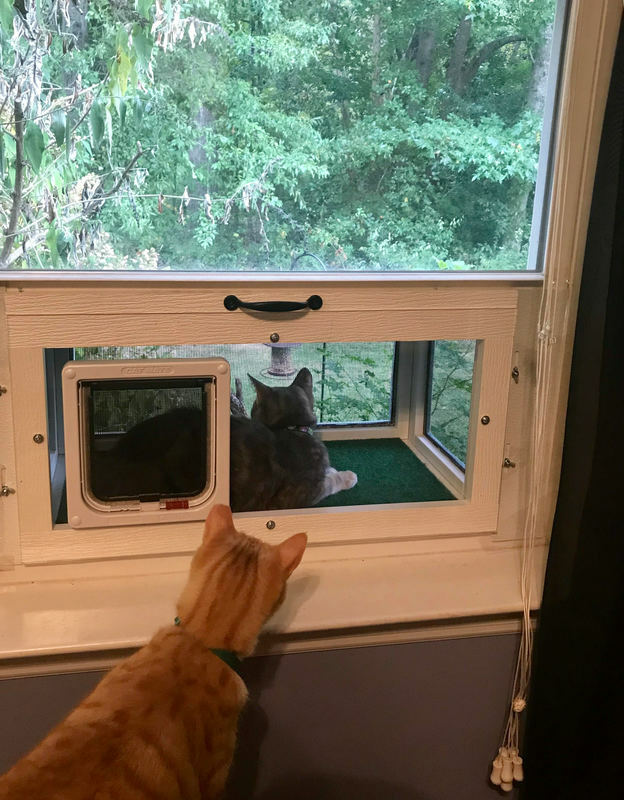 Our Kitty Peeper cat window patio will give your special cat a taste of the outdoor world, where it can feel the breeze, sniff the air, and survey the surroundings in complete safety and comfort! 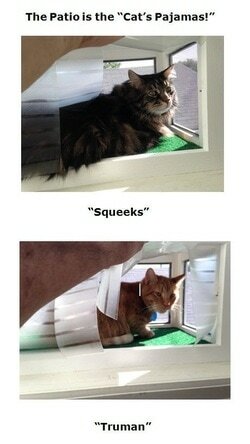 Indoor cats deserve better! Watch our Video! 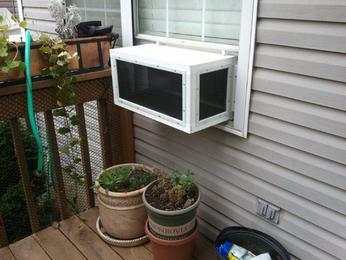 Give your cat the opportunity to enjoy the fresh air as much as you do! Our domesticated furry friends are really wild animals just below their cuddly surface. Unfortunately, it's not always safe to let our cats run around outside, where any number of things can jeopardize their well-being. Our Kitty Peepers give customers a way to help their cats "tap into" their wild side. Cats receive lots of information about their surroundings by using their enhanced smell and sight senses, and our patios give them an opportunity to use both in a more natural environment. 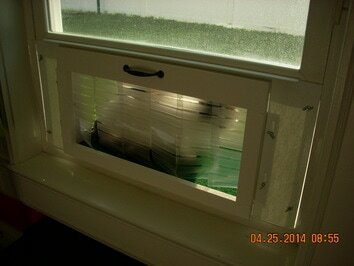 Our Kitty Peepers help reduce indoor kitty boredom by giving cats their own little sun porch. Kitty Peepers act as portals to the outside, allowing indoor cats to experience changes in the weather, and even anticipate seasonal changes. 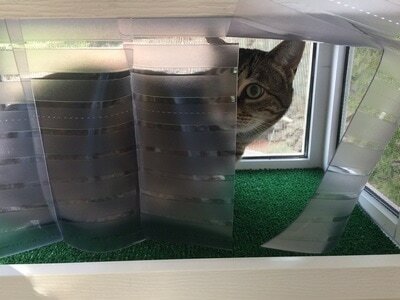 A Kitty Peeper can help keep your indoor feline pets happy, healthy, and vibrant! Our Kitty Peeper patio enclosures come in two sizes and will fit most any size up and down or sliding window. 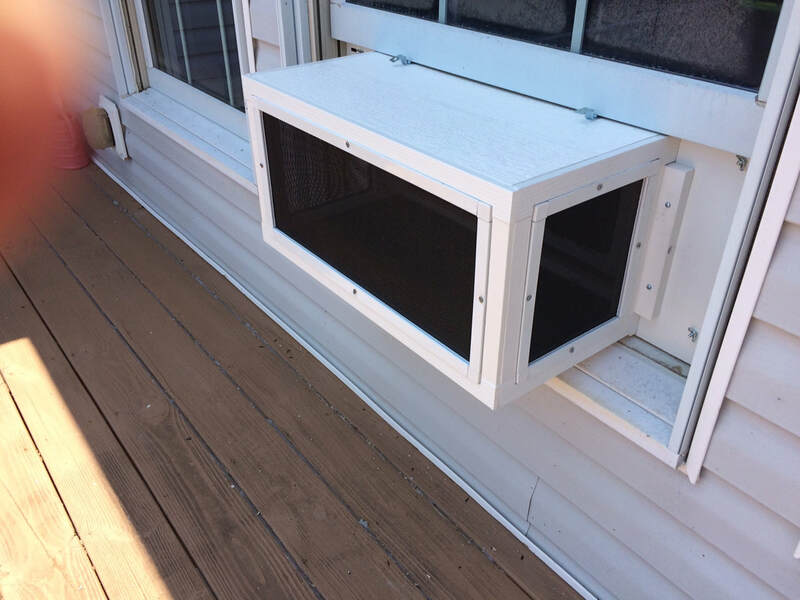 Installs in seconds and offers your pet a safe alternative to actually going outdoors. Ready to go right out of the box! 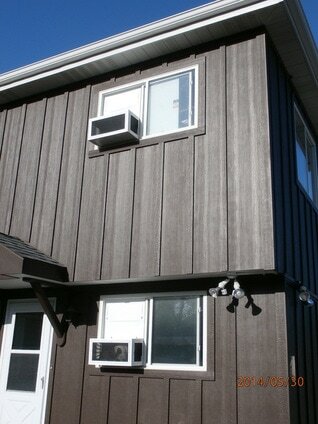 Adjustable left and right side panels come with each unit (or top panels for sliding windows)! Looks great in the Window! 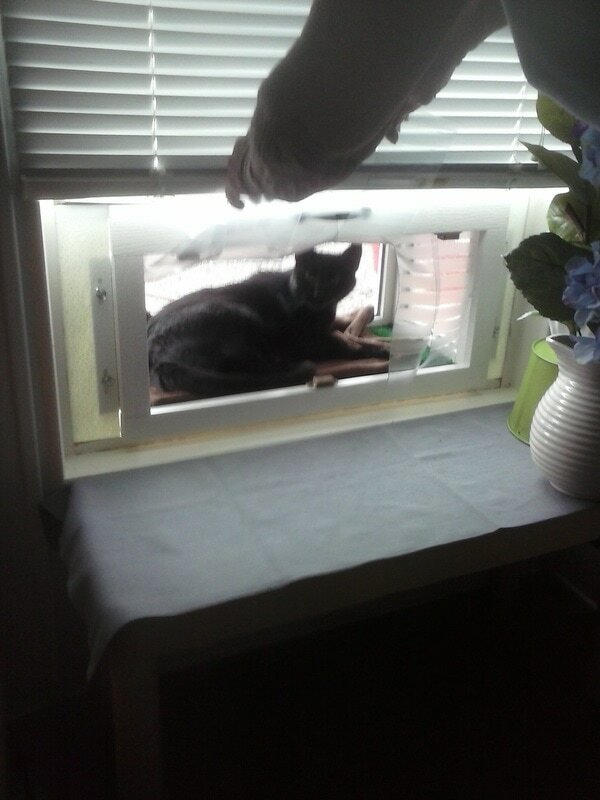 Why not put your cat out a window? 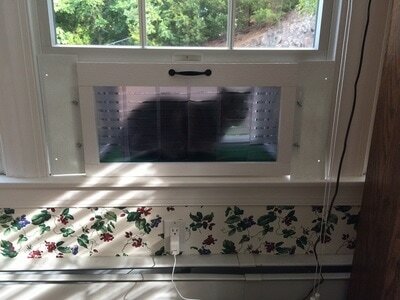 More information on Kitty Peepers for up/down windows here. Watch our video here, and see more pictures here. Read our customer comments here. 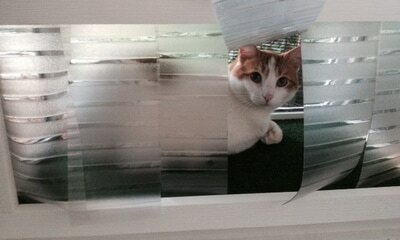 Our new cat door model! Let it rain and snow! Our Kitty Peepers can handle snow, ice, and rain! with design features both cats and humans will appreciate! The discerning cat owner is faced with a daunting list of choices when considering cat products. At Cats With An Altitude Crafts, we take great pride in offering a product that is unique, functional, and aesthetically pleasing. 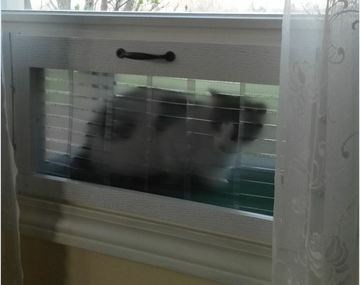 Are there other cat window patios available? Sure. Cats like boxes! And we crafted our Kitty Peepers to make them comfortable! Those features alone distinguish our product line from nearly all other cat perches or patios! Few commercially available things these days--much less in the pet business, are truly handmade and built in the US with components purchased through local supply centers, but that's precisely how we do things. Our core design uses reinforced pet-protective screening that blocks rodents and other animals that could spread disease to your pet, components that are cut and put together by hand, and a PVC plastic frame that sports a wood-grain finish which can be painted or stained, and which will never rot or deteriorate. Much lighter than those others made with wood, steel or aluminum, there is NOTHING that is screwed into or bolted into the window frame, and each Kitty Peeper comes with a complete selection of side panels to accommodate a variety of window widths, so moving it to a different window isn't a problem! 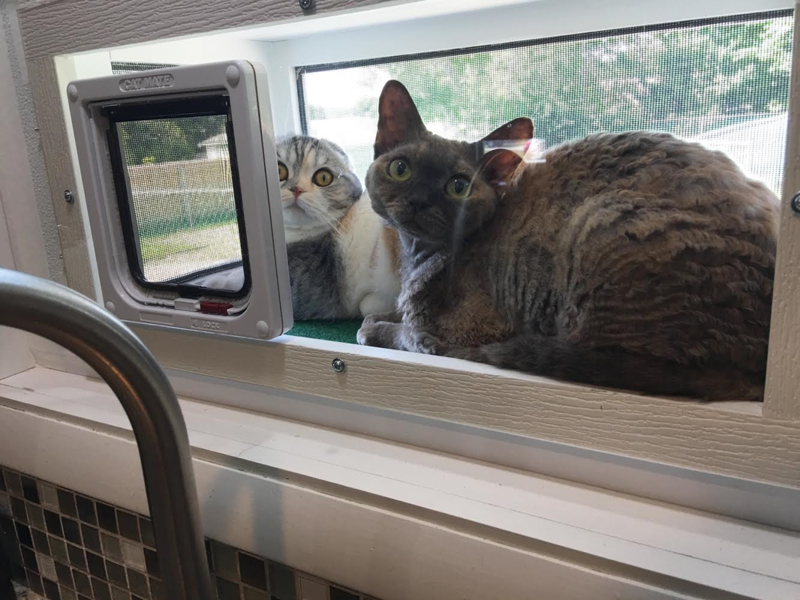 Our Kitty Peeper™window patio was designed to be highly appealing to cats. 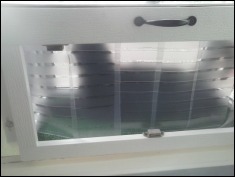 For example, our design features a roof, which in combination with the black screening, provides cats with a "prowl like," stealthy outdoor experience aligned with their natural instincts and desires, and which protects them from too much direct sun exposure which can lead to skin cancer in certain breeds, all without hampering their view or their safety. Cats spend a lot of time in their Peepers, so this is important. 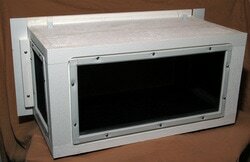 Our most popular models include a flap system as an entry-way, keeping the hot (or cold) air outside, where it belongs. 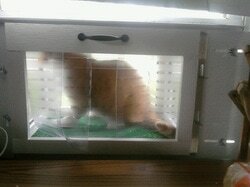 We also offer a model with a plexiglass front with a cat door. Other manufactures often have either no entryway protection. But we didn't forget humans, who unlike cats, have credit cards and PayPal accounts. 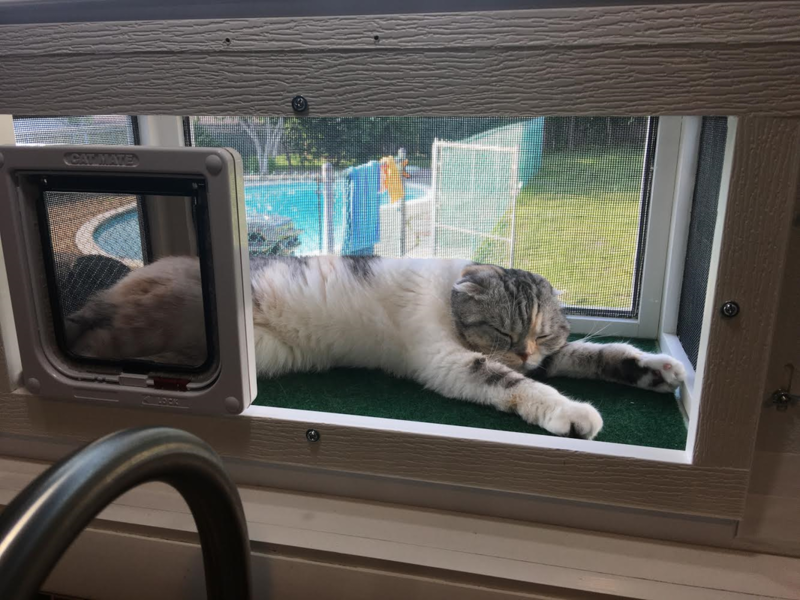 Our Kitty Peepers were designed to be appealing and attractive, adaptable to virtually any regular up and down or sliding window that is wide enough. They don't look like the plastic or steel "Jungle Jim" enclosures typically sold by our competitors, and thus are more appealing to apartment managers and home owners associations. Please look around our site. If you have any questions, we'll be happy to help. 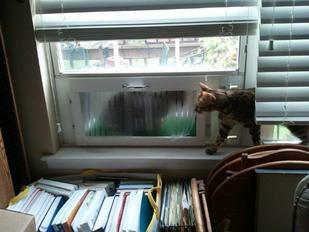 Just use our contact us page, and we'll be in touch before you can say "Kitty Peeper" five times fast!